Thailand Toy Expo pulling out more surprises! 1 more colour of Halu which is in collaboration with Thailand’s famous social critic and webpage called ejeab (อีเจี๊ยบเลียบด่วน). Today was the launch of the TTE edition and now we have 1 more edition was announced TODAY, wait it seems like this new pink was randomly added into each of the Halu as a special edition! A true blind box style we are assuming only the 3.5″ versions would have the pink edition. So every 3.5″ Halu purchased you might be lucky to own the pink edition. The figure comes in two sizes: 7” and 3.5” and will be sold exclusively at THAILAND TOY EXPO. The original VARANUS that was shown at TTE 2017 as well as updated around 4 months ago. 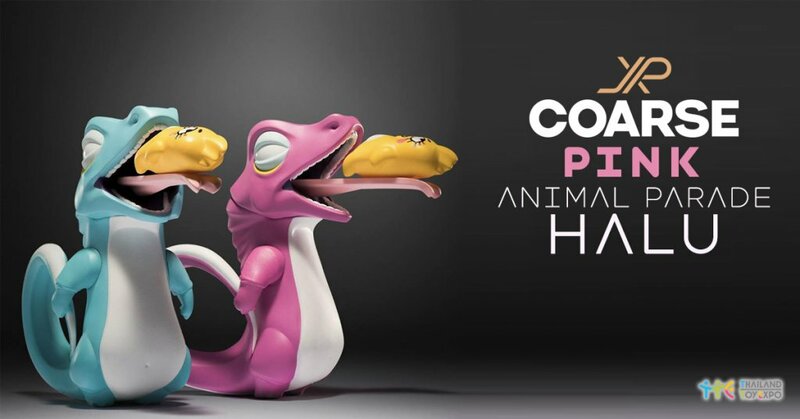 We have spoken to Jeep from JPX and one of the organisers of Thailand Toy Expo today to shed a little more light around VARANUS and the idea behind Animal Parade 3 : Halu.